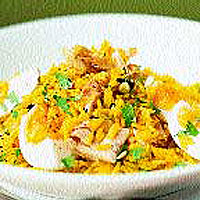 Hot-smoked salmon flakes add a rich, intense flavour to this simple kedgeree. Serve with a relish such as mango chutney. Place the eggs in a small pan and cover with cold water. Bring to the boil and cook for 8 minutes, then run the eggs under cold water until cool. Peel and cut into quarters. Heat the pilau rice in the microwave according to the pack instructions. Place the cooked rice in a large serving bowl and add the salmon, lemon juice and coriander. Season with salt and freshly ground black pepper and mix well. Add the egg quarters and fold in gently. Serve immediately.